Im sorry this is SO late (again) life has been crazy and challenging here! Summer is always busy at my house. Here is a photo of my kids at Story Land from the other day. The kids had a great time! They are at perfect ages to do stuff with. I have a photo of Alexa and Noah in this same pumpkin YEARS ago, long before Amber was even a thought. Cool to see how much they have grown. I always have lots of things I want to do with my children and have just been busy. I love taking advantage of the nice weather. The GOOD news is I went “off”, tactfully I believe, on the OR scheduler and Jay’s surgery will be Monday July 27th! Not too far away. Jay wouldn’t let me talk to them before (for fear of what I may say! LOL! ), but since he was at work I took it upon myself to call! LOL! I am the “fighter” in the family. Jay is very easy going and passive, so I always take on that role! LOL! I am authorized to all his medical stuff, so I took full advantage of that! I think because I have been fighting for Alexa since pregnancy, that I’m just used to having to fight for what my family needs. I make no apologies for it, and make sure that I’m realistic when it comes to what I am asking or expecting. I feel like I am kind of like a mama bear protecting her cubs. I am so glad I did because we were looking into late Sept. He wouldn’t make it that much longer. Many of you mentioned we would have had a call for all the preliminary blood-work and procedures, and we did have all that done already. When I had my gallbladder surgery they called the NIGHT before to set everything up for that next day, so when we didn’t get a call sooner, we weren’t curious about WHY. On another note, Jay had tried every avenue possible for his condition to avoid the surgery. This have gotten progressively worse, and this was his only option. His test results showed that there were no other safe options without risking permanent nerve damage. There is no guarantee it will even work! Poor guy. I threw my back out yesterday, and have been in so much pain since! I can only imagine how he feels daily. I know, usually by day’s end today that I will feel better. I don’t think I could do this every day! So I am going to make this QUICK so I can go. Anway……today is Saturday, so that means it is time for a My Time To Create challenge. This is the inspiration challenge. Get inspored by the pattern, or colors…….whatever! I used variation of the colors. Here is my card—>Using paler versions of the inspiration colors! LOL! This is Dahlia! She is just the CUTEST! So I decided this sentiment “Cutie Pie” from JustRite Tiny Words Borders & Centers Set 1-3/16″ would be PERFECT!! The paper is by Basic Grey! I love the colors and they really made my image POP!!! I *just* got the nestability Pinking Circles. They are so cute too. Well I’m off and running! 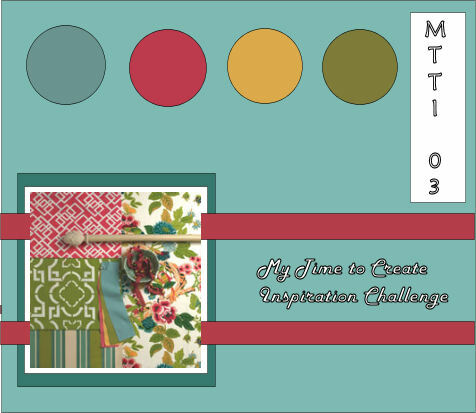 Be sure to pop over to the Design Team blogs for more inspiration from the challenge! They are really Rockin out the samples! 20 Responses for "A Greeting, and a Challenge"
Loved the inspiration and your card! Cute pic of the kids! So glad you were able to put the fear of God into those schedulers and get Jay’s surgery rescheduled sooner! Hope he is well soon….you too! good for you. best of luck on the surgery. just bought milk made templates. off to read! So glad to hear that you got the surgery moved up. That was definitely the right thing to do. I hope you enjoy the day today. Cute photo of the kids!!! Isn’t it fun to look back at old photos and see how they’ve changed?! Glad you fought for Jay and got him in soon…only a week or so away!! I had to smile at the picture- it looks like it was a fun day! Gosh, I remember when you showed us that picture of Amber falling asleep on the stairs – she was so tiny then. All of them have grown up so much! Sorry about your back – it stinks, I know. Sending you and Jason “get well hugs”. I’m so glad you were able to get the surgery moved up sooner Lauren. That’s just plain crazy to make Jay wait that long on their office staff’s mess up. Way too cute with the card as usual. Hope you had a blast today with the family. I can remember going to Story Land (and Santa’s Village) as a child with my family. I have some great memories from those trips. Glad you have an earlier date for Jay’s surgery. Sometimes, you do have to get in there and fight for what you need; sad, but true. I’m glad Jason is getting the surgery done soon. I know how much pain that can be, with my own experience. It is not something you mess with. It can cause long term nerve damage if not taken care of. My prayers are with you and your family as always. P.S. Some people feel soooo much better after surgery (due to alot of the pain being gone), that they try pushing themselves, take the FULL 6 weeks to recover. I pushed myself and ended up hurting myself, which of course made recovery longer. When they say don’t lift anything, they mean it. Nothing! Sorry for being so long, just letting you know that you are not alone, and that we all care about you and your family. Thanks for all the inspiration! Where is Storyland? Is this in Disneyland or Disneyworld? Adorable card!! LOVE Dahlia…so cute :O) And that patterned paper is perfect for the inspiration piece! Also love the photo of the kids in the pumpkin! It turned out great and will be nice to look back on…especially with the one you have of Alexa and Noah. Have a great Sunday, Lauren! Hi Lauren! Thanks for sharing the pix of the kids…so cute! And good for you for being assertive in Jay’s care! You go girl!!! I’ll be praying for a successful surgery for Jay and for healing and for peace and comfort for Jay and for all of you. Love the inspiration and your card is so darling. I agree on TGF images…they are darling. Your coloring is perfection! TFS! What a cutie pie – for sure! Glad to hear things are moving along for Jay and to see pics of the kids. Have a great week ahead. Yay! Good for you, for going to bat for your husband. Aww, we went to Storyland so many times with our kids… it makes me sad that they are grown up now sometimes. But what fun memories ! You are making memories right now! Enjoy! It turned out great and will be nice to look back on. Sorry for being so long, just letting you know that you are not alone, and that we all care about you and your family. Thanks for all the inspiration! I’m not saying that everything is fine Moc boot copper and that there’s no such thing as climate change. Not at all. What I’m saying is that all of these scientists and do-gooders and TV people—when they talk about making changes and ‘saving the polar bears’”—he made little air quotes with his fingers—“it might be as much about themselves as about the bears. As long as people are around, Redwing Shoes you’re not going to stop them from taking planes, taking trains, taking ships, driving in cars, driving trucks, and you might as well throw in space shuttles as well.